Every Barbarian knows that the Mace is the weapon of choice for intense combat. Realistic Look Harmless Medieval Knight Crusader Soldier Warrior Barbarian Plastic Mace. Fit For Destroying Any Imaginary Foe! 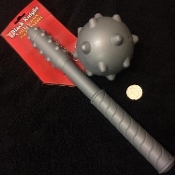 Safe, gray color hollow plastic makes this classic mace just a little safer. Hollow plastic ball with rounded molded spikes approx. 4-inch (10cm) Diameter with attached metal chain links on hollow sculpted plastic 12-inch (30cm) Long handle. A plastic ball attached to a plastic stick and chain. Good for any gothic medieval based show: Game of Thrones, Camelot, MacBeth, Vikings, etc. Great wicked costume accessory for medieval knights, barbarians, Vikings, warriors or crusaders.